Use our Skull Beverage Server to dish out your favorite hot or cold liquid concoctions. From the black cat on top, skull-and-crossbones frieze, bat handles, and pumpkin shape, all the classic Halloween icons are given their due. Department 56 Krinkles Witch Cookie Jar Meet the Krinkles Witch! This sweet woman's hat is decorated with autumn leaves and her pet rat is nestled between her feet. This ceramic cookie jar stands 14 inches tall. 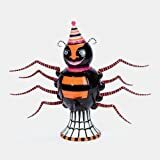 Department 56 Spider Cider Server Standing 20 inches tall, this ceramic glazed cider server will be a great addition to your Halloween beverage table. Beverages are kept warm with the tea light that is inserted into the back of the base. Fill the beverage cavity by removing the hat/lid on the spider's head. Stephen Brown and Bryan Wilkerson designed this for Glitterville Halloween exclusively for Department 56. Halloween© Stainless Steel Party Tub Whether it's for bobbing for apples or for your bar or buffet table this Halloween, our Stainless Steel Party Tub will add personal style to any Halloween gathering! Bottles of wine, beer, soft drinks and other libations stay deliciously chilled and conveniently presented for guests to enjoy at your next gathering. Halloween "Witches Brew" Beverage Tub A Personal Creations Exclusive. 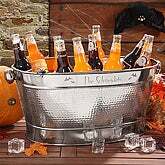 Serve up some spooky witch’s brew this fall from our galvanized drink tub! This waterproof tub will not rust and features easy tote handles on each side. We personalize any line, up to 16 characters on one side. The other size of the tub is engraved with a "Cheers" message. Add our convenient iron stand for easy serving at your next barbecue or party. (Iron stand is not included, available as accessory below.) Tub measures 23"Lx12"Wx7"H.
• Dimensions: 14 X 5.5 "
Department 56 Bone Appetit Platter Serve your ghoulish treats on this bone chilling serving platter! Hand painted, glazed ceramic with dimensional handles, this platter is food-safe and was designed by Stephen Brown and Bryan Wilkerson for Glitterville Halloween exclusively for Department 56. Spiderweb Candy Serving Bowl Add a haunting flavor at your next Halloween party with our Spiderweb Candy Serving Bowl. This candy serving bowl is perfect for candy, nuts, or condiments. Food safe. Hand wash only. Skull And Crossbones Bar Set Shake up some frighteningly delicious drinks for grownups this Halloween with this black and white glass cocktail shaker. The classic shape of the sturdy glass container and the fitted stainless steel strainer make it ideal for mixing and pouring party drinks. Dishwasher safe. 24 oz. capacity. 3¼" dia., 10½"H. Serve your drinks with skull and cross bone shaped ice cubes. Our set of Spiderweb Serving Dishes add an appropriate Halloween touch without going over the top. Polished cast aluminum gives our web server the look of silver, but without the scary price tag. Each dish is generously sized for holiday get-togethers. Fitz and Floyd Witch Hazel Chip/Dip No tricks - this chip and dip server is for your Halloween treats only! Fitz and Floyd Witch Hazel Platter Looming under a moonlit sky, this fashion-conscious Halloween horror will charm the devil out of you. Warts and all this "Hazel" will dazzle you. skull punch bowl set Whatever is mixed in this bowl will stir the insides of its drinkers. This punch bowl will add an element to any Halloween party that only a seasoned party giver will accomplish. Cheers and jeers! Plastic. Includes: 6 small cups, 1 ladle, and 1 punch bowl. 16" diameter and 5" deep. Spiderweb Chip 'n Dip Great for entertaining, this fun Chip 'n Dip is ideal for holding chips, bread, nuts, candies and more. Chip bowl - 16" L x 15.5" W x 2" H.
8 Piece Skull Punch Bowl Set Skull Punch Bowl Set includes a punch bowl that has skulls all around it, a skeleton arm ladle and 6 skull cups. Made of hard plastic. Bowl measures approximately 14" wide x 5" high. Not for dishwasher or microwave use. Not for hot liquids. Skull Beverage Funnel Package includes (1) polystyrene funnel that features a realistic skull funnel to pour your beverage (not included) into and a spine tube to drink from. Measures approximately 33" long. Party Crasher Table Cloth A fun way to serve Halloween snacks! Inflatable centerpiece and snack bowl, tablecloth included. Fitz and Floyd Halloween Canape Plate This hand-painted canape plate features a funny and bewitching message -- one that is repeated on the set of snack plates, available separately. Care: Wash by hand. gothtini martini glasses and shaker Serve spooky sips with this chilling set. The plastic martini glasses bear the word "gothtini" and taper to stacked skull stems. The shaker features a menacing skull daring guests to guzzle their poison. Glasses: 3.5" wide by 6.5" high. Shaker: 3.5" by 8" high. Set of 4 glasses and 1 shaker. skull ice bucket Chill the ice and the guests with this plastic skull ice bucket. Complete with matching ice tongs, it's a menacing addition to your haunted house bar. Bucket: 9.5" tall by 8" wide. Tongs: 7" long by 2" wide. pumpkin bowl Keep this ceramic pumpkin stocked with treats all autumn long - gingersnaps for everyday, candy for Halloween and pumpkin spice cookies for Thanksgiving. Yum! Comes with lid. 5" by 5.5". 30 oz. capacity. Halloween Trick or Treat Melamine Chip & Dip Serve up a great Halloween party with our Halloween Trick or Treat Melamine Chip 'n' Dip! This chip platter is decorated with black and orange spirals and circles and the dip bowl has a spider design on the bottom of the bowl. Sold as a set with one chip platter and one dip bowl. "Boo" Candy & Snack Dishes Set of 3 fun, glazed, orange, ceramic letter dishes are perfect for dips and snacks. Fun table decoration that serves up perfect function for holiday parties! "B" is 7 3/4 x 5" and "O's" are 7 1/8 x 5 3/8". Put Em On Ice Bucket Includes (1) plastic gruesome ice bucket in the shape of an autopsied head with sewn up lips. The top of the head comes off and has a knife sticking out of it. Made of hard plastic. Bucket measures approximately 7"" wide x 10"" high x 7"" deep. Caution: Not dishwasher safe. Clean with warm water and mild soap. Pair of metal tongs that look rusty included. Tongs measure approximately 6"" long." Sur La Table Halloween Ceramic Sectioned Serving Dish Pumpkin-orange ceramics are perfect for ghoulish treats and potions. Safe for dishwasher and microwave. 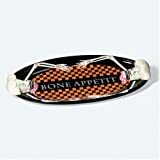 Scary Bones Ceramic Cheese Plate Halloween Party Decor (B319) 11in. diameter plate. • Bowl holds 8 Oz. Pumpkin Serving Tray Celebrate the spookiest time of year with our Pumpkin Family Serving Tray. It will add just the right touch to your holiday table. Present your treats, drinks or other desserts on our eye catching black wood tray. We personalize it with any 2 line message, up to 21 characters each and include up to 6 pumpkins, names up to 10 characters each. The serving tray is crafted of cherry wood and features slot handles and rubber feet on the bottom. Measures 8”L x 12”W x 3”H. Celebrate! Oval Serving Platter From spring to summer to Halloween, to wintertime fun and all in between, this vibrant plate holds oddles of goodies in holiday style ï¿½ just the thing to make your party guests smile! Porcelain. Dishwasher and microwave safe. 14" x 11" x 1 1/2" high. • Plate Dimensions: 7 x 8 "
• Plate Dimensions: 11.5 x 7.75 "
• Plate Dimensions: 9.75 x 8.25"
Our Halloween Goblets allow you to pick your poison. Giant goblets warn of dangerously strong drinks with cool Creeper font. Use goblets to hold finger food or to-die-for cocktails. Goblets are completely food-safe. Halloween Horror Platter Includes one Halloween Horror plastic platter that measures approximately 14" wide x 17" long. Screaming Spirit Bowl Includes one plastic bowl. Bowl is approximately 10.5" wide and 5" high. Made of injected molded plastic. Not dishwasher safe. Hand wash only. Screaming Spirit Shaker Includes one plastic shaker and lid. Made of injected molded plastic. Not dishwasher safe. Hand wash only. Approximately 11" tall with lid. Sparkle Spider Platter Includes one Sparkle Spider Platter that is approximately 16" wide x 14.5" long and features orange spiders around the rim with a black spider in the center. Sparkle Spider Condiment Dish Includes one Condiment Dish that features 3 condiment bowls with orange spiders and silver glitter on the inside. Approximately 9.25" wide x 9.25" long x 2.5" tall. Sparkle Spider Large Bowl Includes one Sparkle Spider Large Bowl that is approximately 10.5" wide x 4" tall. Bowl features orange spiders on the outside and glitter on the inside. Halloween Horror Ladle Halloween Horror Ladle is made of durable plastic and looks like a bony, skeletal arm. Ladle measures approximately 2" wide x 12" high. Not for microwave or dishwasher use. 11"" Large Orange Glitter Bowl Includes (1) 11" bright orange plastic bowl that has sparkly glitter throughout the bowl with a wavy pattern. Please Note: Not for boiling liquids, dishwasher or microwave use. Halloween Cupcake Tray Package includes (1) tiered paper cupcake tray that is shaped like a haunted house and 2 orange tiers to place your cupcakes on. Measures approximately 13.25"" in diameter x 10.75"" high. Please Note: Cupcakes are not included." Skull Martini Set - (5 pc Set) This 5 piece Skull Martini set includes: a plastic shaker (approximately 6" tall) with a skull on the front and removable purple lid along with 4 plastic glasses with skull stems and ""gothtini"" printed around the rim. Glasses are approximately 6"" tall. Halloween Horror Ladle Halloween Horror Ladle is made of durable plastic and looks like a bony, skeletal arm. Ladle measures approximately 2"" wide x 12"" high. Not for microwave or dishwasher use. Halloween Chip and Dip Platter Halloween chip and dip platter. Ceramic. Handwashing recommended; NOT microwave safe. 10 1/8" x 14 1/8" x 1 1/2". Health Hazard Food Containers Nuclear Waste , Bio-Dangerous, and Experimental Meal re-usable containers have danger warnings all over them, so you'd have to be crazy to eat out of them. • Bowl holds 10 Oz. Spider Ceramic Chip and Dip Partyware Set Halloween on your dinner table with the Spider Ceramic Chip and Dip Partyware! Make it the centerpiece of your Halloween party snack spread, or combine it with our other spider ceramic partyware to create one spooky setting. This Halloween Spirit exlusive is dishwasher safe. Spider Ceramic Platter Wrap your table in a costume with this Spider Ceramic Platter! This Halloween Spirit exclusive is the perfect serving dish for your Halloween party. Group it with our other ceramic spider partyware to make one spooky spread. Spider Ceramic Serving Bowl Make this Spider Ceramic Serving Bowl the centerpiece of the spread at your next Halloween party! This Halloween Spirit exclusive serves food while adding to your Halloween decor. Skeleton Party Serving Platter Halloween Party Tray (B240-595) Thin, plastic tray perfect for serving food at a Halloween party. 18in. diameter.